Well, not really. 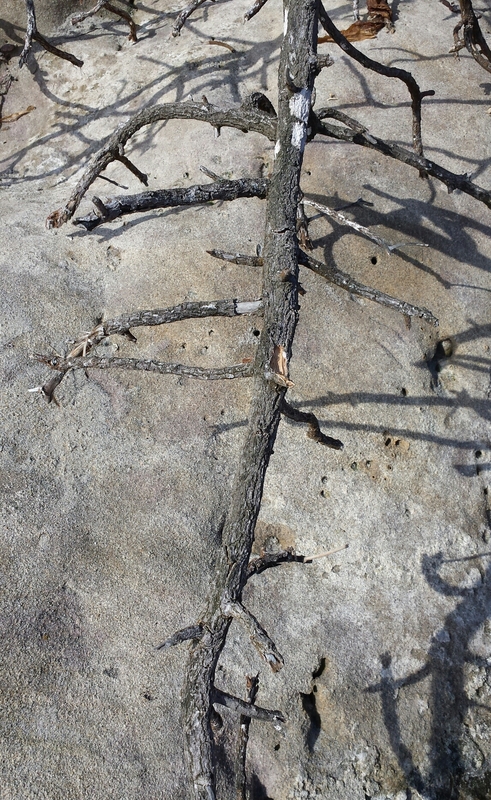 Rock, dead twigs, shadows. 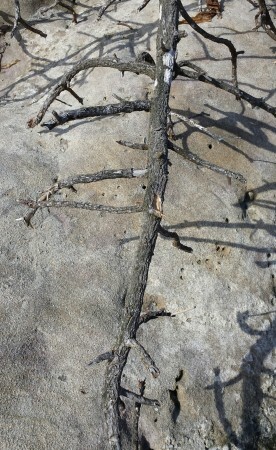 I don’t need to invent glyphs when nature does such a good job. This, along with the water and sky, was the beautiful part of the beach today. The beach also had ugliness today, though. The overwhelming emotion during the walk was distress. In the last week or so, the campground has opened up new spaces, and there are far more people on the beach than we’ve seen before. Perhaps more families are on vacation. It’s spring break. That’s all fine, BUT: The amount of litter on the beach was so enormous that it was distracting, and the litter itself was varied and pervasive. You couldn’t walk two paces without seeing a crushed plastic bottle, a bottle top, a candy wrapper, a piece of plastic, odds and ends of paper…it was as if someone had carried a huge garbage bag full of stuff and strewn it behind them in the wind. We talked about returning to the beach tomorrow with a big empty trash bag and plastic gloves. But the beach is at least 3 miles long and probably over 50 feet deep at low tide. An overwhelming job. A sad job. Do the state employees do cleanup? It was one thing to see the storm expose/deposit all those stones; it is quite another to see people leave their trash with such disrespect for this beautiful place.